Chainsaws are important tools for harvesting firewood, but when money is tight, it is sometimes practical to use a bow saw and sawbuck for part of the task. Bow saws don’t have many parts, don’t often break, and never run out of gas. They do require replacement blades from time to time. A bow saw with a 21- or 24-inch blade can be picked up for about $10, and the bigger 30-inch saws can run between $35 and $50. Modern bow saws are different from the older designs. Modern saws are made to use blades cut from a steel band; they are very sharp and flexible, but they are not easy to sharpen. The steel band-type blades are made to be replaced rather than sharpened, but with care, a single blade can last years. Stability is important in a sawbuck. To make the most of my labor when using a bow saw, I constructed a sawbuck out of 2×4 scraps. A sawbuck helps hold a log up at a comfortable height for sawing with a handsaw. I started by selecting four pieces each 4 feet long and nailing them together to make two large Xs. I then selected six pieces 3 feet long and nailed two of them just under the crosses. I used four more to connect the feet so the base had a square box shape. Then I nailed a board down to the two horizontal 2x4s. The result was a very simple but very stable and durable sawbuck. Traditional sawbucks used a few pieces of wood as a wedge to hold down a log, but I use one of those ratcheting tie down straps used to secure vehicle cargo. I would use the tie strap to ratchet down wood if needed but when cutting one piece at a time I could more easily hold it with my left hand. Using my chainsaw with a sawbuck, in a single day I cut more than 20 cords of firewood from free pine waste slab.I find that a chainsaw is more practical for anything over 6 inches in diameter, but when I am cutting wood, there are many pole size trees, branches, and saplings that I can pile separately, then bundle and drag in groups with a loop of rope. On a good day I can cut, skid, buck, and stack about three face cords worth by handsaw. This method of cutting wood can clear out all the small diameter wood that most people would reject, and it makes the most of everything on a woodlot. 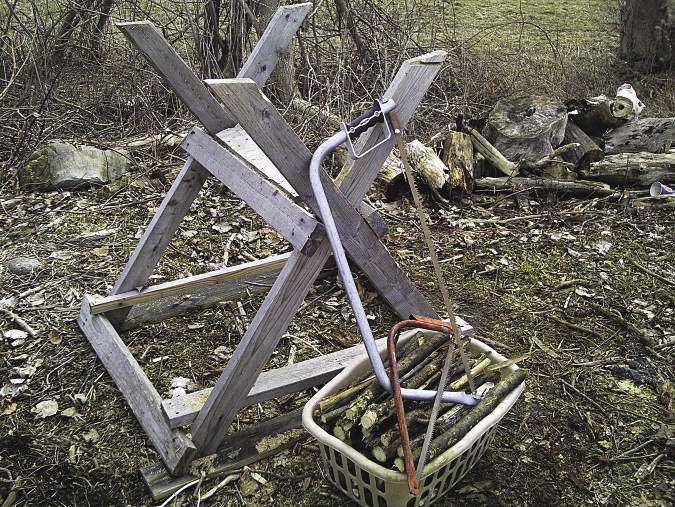 With ax, handsaw, and sawbuck I can churn out 15 cords of small diameter firewood a week. A chainsaw can also be used with a sawbuck to cut large volumes of small diameter firewood. I pile 30 saplings and poles onto it until I fill the trough, use a cargo strap to tightly tie down the whole group. I then use a lumber crayon to mark the pile every 16 inches. The whole pile extends 20 feet with a few of the longest poles extending a little more. After marking the poles I run the chainsaw and walk from one end to the other sawing along the crayon marks (switching ends as needed to maintain balance). 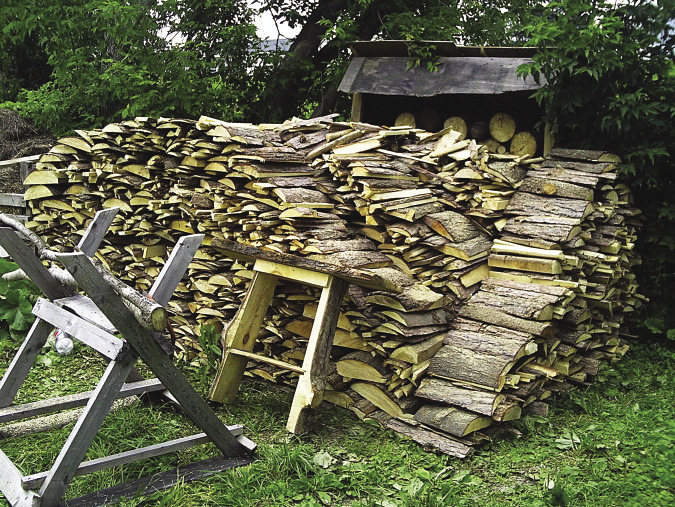 It takes less than two minutes to cut the entire pile into 16 inch firewood pieces. The last cut is the space in the center of the sawbuck so the cargo strap has to be positioned to account for this. It takes very little time to refill the sawbuck and cut another stack. Within 20 minutes I can make two face cords worth of small diameter firewood piled up so high I have to stop cutting and stack it or run out of room under the sawbuck. This past summer I was offered all the waste slab I could haul from a couple of Amish sawmills. After using some of the best pieces for other projects, I started piling the slab onto the sawbuck. In a single day I was able to cut more than 20 face cords worth of pine firewood from that slab, each piece being uniform in size. It took a lot more time to stack it than it did to cut it and I started running out of places to stack it all. Cutting small diameter wood as individual pieces with a chainsaw is wasteful on gas and time and I know many people who would leave the small diameter wood to rot, but using a sawbuck it is effective to utilize the small and otherwise overlooked saplings and branches, cut either as individual poles or in bulk. A good sawbuck is a good investment.